England slumped to a 71-run defeat in the third Test in Dubai to suffer a series whitewash by Pakistan for the first time. Set 324 to win, the England top order was undone by spin before Umar Gul (4-61) ripped through the middle order. Alastair Cook (49) offered some resistance, only to succumb to off-spinner Saeed Ajmal (4-67). Matt Prior showed late aggression and was unbeaten on 49 as England were bowled out for 252. The wicketkeeper's efforts at least took England past 200 for only the second time in the series, but another poor performance was typical of the way their batsmen have failed throughout the tour. "The better team won, that's all you can say, Pakistan have been outstanding, they've been a unit, I've been very impressed by their professionalism, their unity in the field. England weren't technically good enough, strong mentally, Pakistan have completely dominated with the ball. That's been the story of the series actually, ball dominated bat." They managed only five half-centuries in three Tests, while Kevin Pietersen, Eoin Morgan and Ian Bell mustered fewer than 200 runs between them. Indeed, on the entire tour, those three players failed to pass 40 in 29 innings, and Morgan's place especially looks under threat for the two-Test series in Sri Lanka in March and April. By that time, England could be on the verge of being usurped as the world's number one Test side, as South Africa will move to the top of the rankings if they whitewash New Zealand 3-0. For Pakistan, victory after being bowled out for 99 on the first day ensured they became the first side since 1907 to win a Test after making fewer than 100 in the first innings. It completed a remarkable turnaround since the sides last met in England in 2010, a series overshadowed by the spot-fixing scandal. Since then, Pakistan are unbeaten in seven series under captain Misbah-ul-Haq, but this result is by far their most impressive. Their success came mainly thanks to the artistry of Ajmal and slow left-armer Abdur Rehman, who combined to take 43 wickets in three matches. With England, who resumed on 36-0, needing to achieve their second-highest Test run chase for victory, the duo made short work of the top order before Gul's burst. Pakistan were again aided by some dismal England batting, but when Strauss and Cook got away with offering simple chances to wicketkeeper Adnan Akmal and Gul respectively, it seemed luck was with the tourists. However, England managed to play a part in their own downfall, Jonathan Trott and Bell falling to inexplicable strokes and Strauss trapped lbw by Rehman as he again refused to play off the front foot. After Trott uncharacteristically top-edged a sweep to become Ajmal's first victim, England looked to be recovering through Cook and Pietersen, who signalled his intent to attack by launching Rehman for a straight six. Both both were undone by Ajmal, Pietersen by an off-break from around the wicket that went between bat and pad, before Cook was caught at slip via a leading edge. Bell and Morgan managed to stifle the threat of the spinners and forced Misbah into a bowling change after Rehman and Ajmal had bowled in tandem for much of the afternoon session. It was to prove decisive as Bell slapped a Gul long hop to point on the paceman's return, then Morgan, advancing down the wicket, edged behind. Stuart Broad joined Prior in attempting to attack after tea, only to hole out to long-off, before Graeme Swann drove Gul to point. James Anderson shared a ninth-wicket stand of 34 with Prior that was broken when the former edged Ajmal to point, and Monty Panesar was lbw sweeping Rehman. 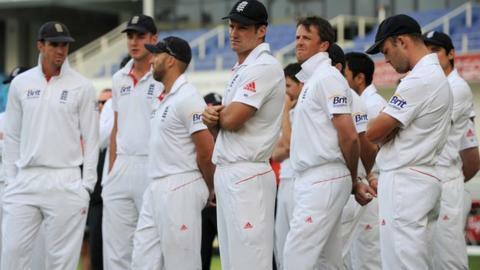 It completed England's seventh losing whitewash in Test cricket and their first series defeat since 2009. You can listen to daily highlights on BBC 5 live sports extra, and listen to Jonathan Agnew and Geoff Boycott's review of the day's play on the TMS podcast.